Mercuri International is regularly rewarded for its top-performing projects in training, both locally and internationally! Rewarded 8 times out of 8 entries! In the TOP 20 for the 8th consecutive year! 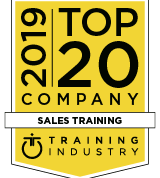 In the TOP 20 Sales Training Companies for the 6th time in a row! Essential in the commercial training category in 2017.